Crusaders skipper Richie McCaw breathed a sigh of relief in the wake of his side's see-saw win over the Western Force, having almost cost them the match with a second-half sin-binning. The All Black captain, played out of position at No.8 by Crusaders boss Todd Blackadder, saw yellow in the 47th minute of the Perth encounter, with the Force bagging a try through Cameron Shepherd and a penalty to Willie Ripia to swing the game in their favour. Late scores from Corey Flynn and Kahn Fotuali'i rescued a 42-30 win for the Cantabrians however, allowing them to keep the pressure on the Blues at the top of the New Zealand conference. 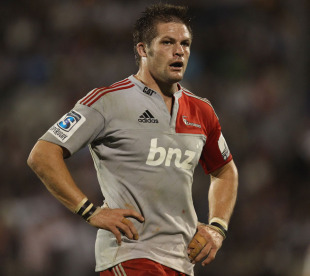 "I was a bit disappointed with myself to be honest," McCaw said. "I knew it was pretty critical to have discipline, I was barking that at the boys and I was the one that gave that penalty away and ended up in the bin. "You could put it down to a bit of rust but I should have been smarter than that. I'm just thankful we got stuck in and got the win." McCaw was making his second comeback after a broken foot and was pleased with his fitness levels. He is anticipating another lift for next weekend's meeting with the Stormers, leaders of the South African conference, when he may be moved back to the familiar No.7 jersey following the return of Kieran Read. "It [the foot] got jumped on at one point but it feels pretty good, it wasn't an issue at all," McCaw said. "I felt remarkably good lungs-wise in getting round the track. Perhaps my timing, you feel your way back into that. I'm pretty happy where I'm at and I'm sure I'll be better for it next week." Meanwhile, Nicholas Barrett has been called up to the Crusaders squad following a back injury to All Black Ben Franks. Barrett will join the squad in Cape Town, while Franks will stay on for further tests.